Sam Thompson ran along the road near the Diamond Head lookout yesterday during his marathon-distance run through Honolulu. FINISHING a marathon is quite an accomplishment for some, but for 25-year-old Sam Thompson, who completed a run similar to the Honolulu Marathon course yesterday, it is all in a day's work. 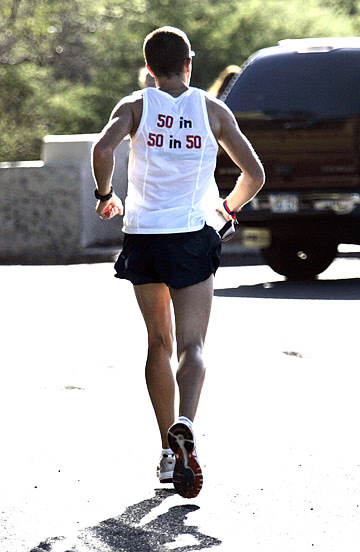 "Each day, I wake up ready for another 26.2-mile jog," said Thompson, who made Hawaii his 12th stop on his 50in50in50 mission -- to run 50 marathons in 50 states in 50 days to raise awareness of Hurricane Katrina victims along the Mississippi Gulf Coast. "I've seen firsthand the vast needs that still exist in the aftermath of Hurricane Katrina, and the decline of media coverage for those victims who still need help," said Thompson, who had the 50in50in50 concept for a while but needed a valiant reason for attempting the feat. After naming his mission, Thompson decided to add an extra marathon race in Washington, D.C., bringing his total to 51 marathons. His journey started July 1 in Leadville, Colo., and will conclude Aug. 19 in Bay St. Louis, Miss., where he has spent the past 10 months laying roofs and hanging drywall with more than 100 volunteers in a Katrina recovery center. The Vicksburg, Miss., native estimated he had completed about 50 marathons in the past five years, as well as a 99-day run along the Appalachian Trail, which spanned more than 2,000 miles through 14 different states. To complete his mission by the self-imposed deadline, his usual daily routine consists of four hours of running in the morning and a quick bite to eat, massage, ice-down and stretch in the afternoon before hopping on a plane or into a rental vehicle to commute to the next race. Thompson, who will appear on CNN and the "Today Show" next week, said somehow he manages to squeeze in the occasional media appearance. Thompson is running 50 marathons in 50 states in 50 days, plus one more in the District of Columbia, to publicize the continuing need to help Hurricane Katrina victims. He said he almost missed his flight and spent 5-1/2 hours on a plane before arriving in the islands, which made the Hawaii race one of the toughest, due to the logistics. His plane landed shortly before midnight, Thompson said, which gave him a couple of hours of sleep before he began preparing for his morning run, around 6:30 a.m.
"It was amazing, beautiful -- a wonderful change from yesterday (Tuesday), when I ran in 116-degree heat in Phoenix," Thompson said of the course that took him a little more than four hours to run from Ala Moana Park through downtown, through Waikiki, through Kahala to the finish in front of the Kapiolani Park Bandstand. Since there are only seven official marathon races on his schedule, he will spend much of his running time on his own, as he did yesterday, with only his support crew of his mother, girlfriend and good friend driving alongside to keep him hydrated and energized. "I can see his dedication to the people there (along Mississippi Gulf Coast). I share his compassion for them and want to contribute in any way I can," said his friend Andres Arciniegas, who serves as Thompson's photographer and videographer. Currently, Thompson is financing his mission on his own. He does not know the total price tag for his journey, but said he hoped to have a corporate sponsor by the end of the week. He had enough time yesterday to take a quick dip in the ocean and grab a bite to eat at his favorite coffee shop, Starbucks, before catching a 3 p.m. flight back to Phoenix and driving several hours to his next run in Albuquerque, N.M.
For more information on Thompson's journey across the states, visit www.50in50in50.com.